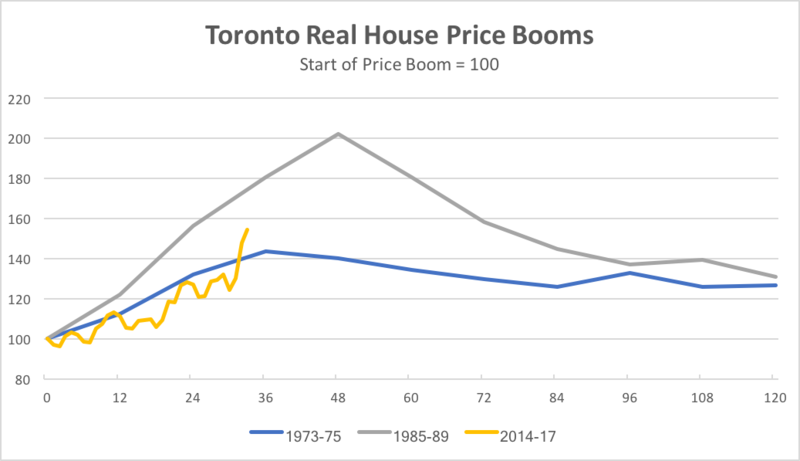 Ted Carmichael Global Macro: Toronto House Price Boom: How Will It End? Toronto House Price Boom: How Will It End? Last year it was Vancouver house prices. This year it is the Toronto housing "crisis" that has politicians panicking. In March, the average Toronto house price was up 33% over a year ago. This news sparked a meeting of "three wise men" -- Canada's Finance Minister Bill Morneau, Ontario's Finance Minister Charles Sousa, and Toronto's Mayor John Tory -- to collaborate on appropriate actions to ease the panic. The three wise men agreed that they should refrain from adopting policies which would add to already overheated demand. Then within days, Ontario's Liberal government announced a "suite" of measures to respond to what they claimed was a public clamour for government intervention. Premier Kathleen Wynne and Mr. Sousa, not wanting to let a good crisis go to waste, seized the opportunity to impose a new 15% tax on non-resident buyers and tighten housing regulation in the worst possible way by imposing strict rent controls. Unfortunately, such actions that are more likely to worsen rather than improve the fundamental problem of insufficient supply of reasonably priced housing. I am returning to the issue of housing prices after writing about it in March, 2014 in Why So Paranoid About Canada's Housing Market, and again in June 2016 in China Stimulus and Vancouver House Prices. In March 2014, I argued that, while some high profile commentators thought Canada was in the midst of a housing bubble that was on the verge of bursting, my research showed that Canada's housing prices were still good value relative to house prices in other countries and that there was no reason to think that a Canadian house price bubble was about to burst. Looking back, that view proved correct. Far from bursting, house prices in Vancouver, in Toronto and in several other Ontario cities have since soared a further 50% or more. In June 2016, after Vancouver house prices had shot up over 50% in just three years, I acknowledged that they had entered bubble territory. I pointed to the effect of spillovers from China's aggressive easing of monetary policy on house prices in cities in China and also in cities such as Vancouver and Toronto that are attractive to Chinese investors. I argued, "It is the job of Finance Minister Morneau, along with provincial and city officials, to decide what measures might curb the influence of foreign central bank stimulus on Vancouver and Toronto house prices and how these measures might be applied without bringing about [a] sharp house price correction". In July 2016, Vancouver introduced a 15% Foreign Buyer Tax. In November, the city followed up with a 1% annual tax on the assessed value of vacant houses. Vancouver home sales fell immediately following the introduction of the Foreign Home Buyers tax and prices experienced a moderate setback for a six months before starting to climb again recently. To read the local newspapers, you would think that Toronto house prices have never boomed before. There are widespread complaints that available housing data are insufficient to determine the causes of the recent rapid price appreciation. But it's not hard to find data that shows that Toronto has been here before. 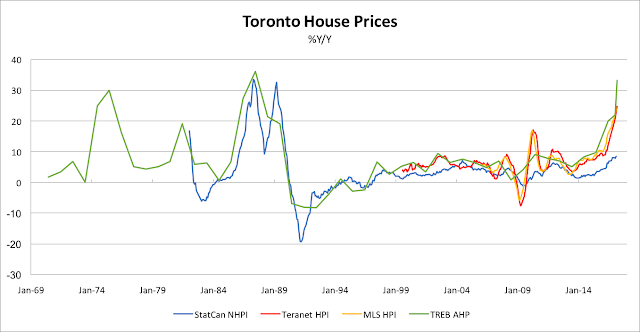 The chart below shows several measures of Toronto house prices dating back to 1969. The data goes back furthest for the Toronto Real Estate Board average house price (TREB AHP). Also shown are Statistics Canada's Toronto New House Price Index (NHPI) and, more recently, the Multiple Listing Service Toronto House Price Index (MLS HPI) and the Teranet Toronto House Price Index. While the quality of some of these measures is better than others, all of them tell basically the same story. There have been three house price booms in the past five decades in which annual increases reached double digits for consecutive years and peaked at 30% or more. The first episode, in 1974-75, saw average house prices rise 25% and 30% in consecutive years. In the second episode, in 1986-89, prices rose consecutively by 27%, 36%, 21% and 19%. In the current boom, 2015-17, average prices are on track to rise 15%, 20% and over 30% consecutively. After the 1974-75 boom, price increases slowed sharply. After the much bigger 1986-89 boom, prices collapsed. The chart below uses the same data as above, but expresses it as drawdowns in prices from their previous peak. 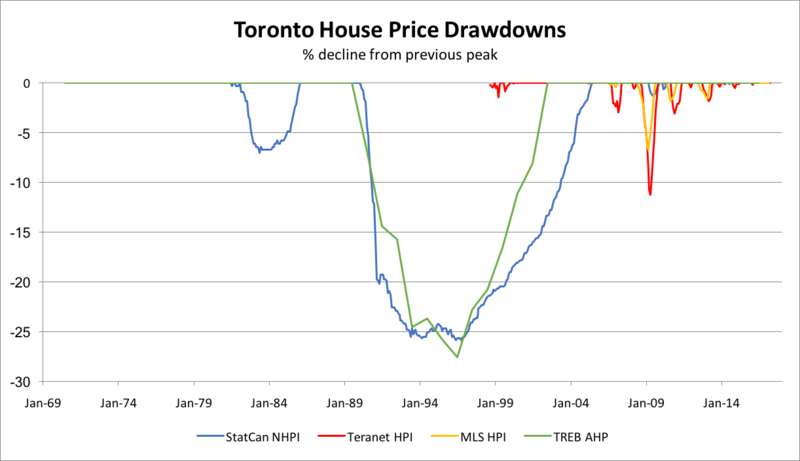 What is clear from this chart is that the drawdown following the 1989 peak was by far the worst house price decline experienced in fifty years. Prices for both new and existing homes fell over 25% and did not hit bottom until 1996, seven years after the boom peaked. How Did Previous House Price Booms End? The results were devastating. Rental housing supply screeched to a halt, vacancy rates quickly began to drop, rents began to rise and tenants couldn’t find apartments. Investors all pulled out of Ontario rentals; they could not operate under a system that incented owners to cut back on investment and let the buildings deteriorate. 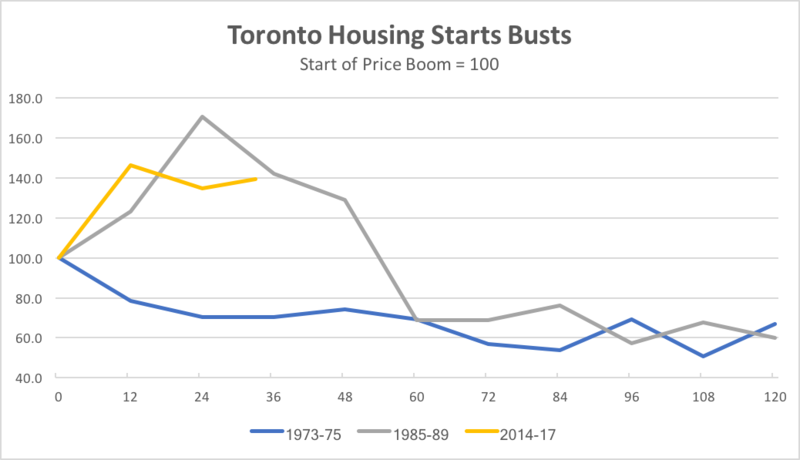 The bust in the housing market that followed the 1974-75 boom was concentrated in the collapse of rental housing construction that dragged on for over twenty years and greatly curtailed both the quality and availability of affordable housing in Toronto. 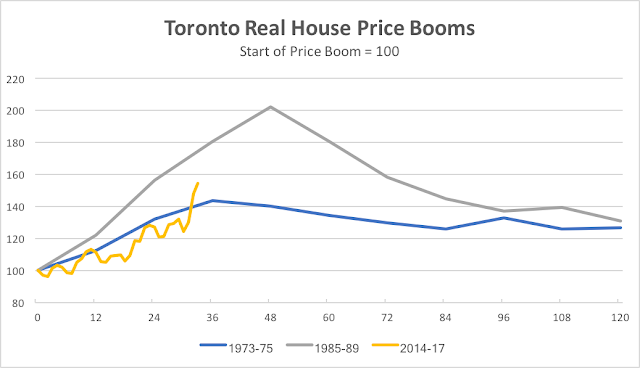 The 1986-89 boom, the biggest Toronto house price surge of the past 50 years, was ended by a combination of rising mortgage rates, a short-lived oil price spike brought on by Iraq's invasion of Kuwait, and another North American recession. After the huge boom, prices plunged and would not recover to their 1989 peak until 2002. 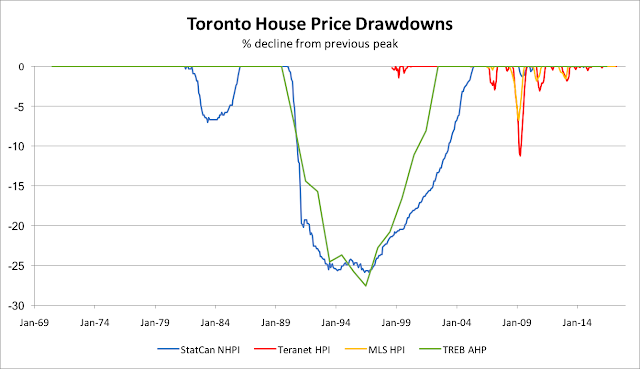 Toronto suffered through a lengthy house price deflation in the 1990s. Eventually, with the election of Conservative Premier Mike Harris on his "Common Sense Revolution" platform, rent controls ended in 1998 on buildings constructed after 1991. This move launched more than a decade of strong construction activity of both privately-owned and rental housing in Toronto that has changed the face of the city. 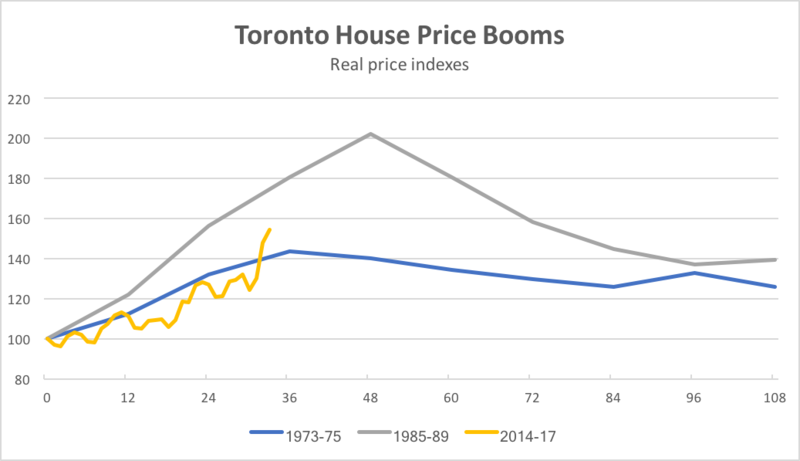 The current Toronto house price boom is more pronounced than that of 1974-75 but less pronounced and extended than that of 1986-89. The chart below shows the three booms, with the start date set when annual house price gains exceeded 10% on a sustained basis. The horizontal axis shows the number of months from the start of the boom. The prices are in real terms (i.e. deflated by the CPI) to make them comparable. The chart shows that the current boom has just about matched the 1973-75 boom in duration (at 33 months vs. 36) and that cumulative real price appreciation since the start of the boom has been 55%, about 12% more than at the peak of the 1973-75 boom. However, the current boom has not yet come close to matching the 1985-89 boom in either duration or cumulative real price appreciation. This implies that the current boom could go on for more than another year and prices could rise by a further 30% without exceeding the 1985-89 boom. However, that may seem unlikely because governments are already taking active steps to cool the market. The current boom bears more similarities to 1973-75, not only in duration and magnitude, but also in the types of government action taken to cool the boom, influenced by political pressure on an Ontario Premier ahead of a provincial election. When the two previous booms ended real house prices fell. After the 1975 peak, real prices fell 12% over the next six years. Following the 1989 peak, real prices fell 35% over the next six years. Housing starts also went from boom to bust after the housing price peaks, as shown in the chart below. Following both the 1975 and 1989 peaks, housing starts plunged by more than 40% compared with their level at the start of the price boom. The current boom lies in between its' predecessors. If we are seeing the peak now, it might be reasonable to expect real prices to decline 15-20% over the next six years. However, as occurred following the 1975 peak, construction of rental housing is likely to fall dramatically and the availability of affordable housing is unlikely to grow. Of course, if the current boom continues for another year and another 30% price appreciation, it would look more like the 1989 peak. In that event, a deep, long house price recession would become likely and future real prices might then be expected to decline something like 30-35% from the peak. Some may say that Toronto house prices will never decline. But they have in the past. Ben Bernanke famously said in July 2005, "We’ve never had a decline in house prices on a nationwide basis. So, what I think what is more likely is that house prices will slow, maybe stabilize." That seems to be the hope of the three wise men. But Toronto's history clearly demonstrates that there is a good chance that, like its two predecessors, this boom will end badly.